With eating disorder awareness week from 25 February to 3 March, society shows it cares about this tragic illness. There will be fund raising events at hospitals and by companies such as BEAT’s Sock It campaign and opportunities for people to join in events in their local areas. When you are struggling within the grip of an eating disorder, you may feel very alone. But this is an illness that a lot of people in society care about, enough to raise money, raise awareness and make it an annual event in February. 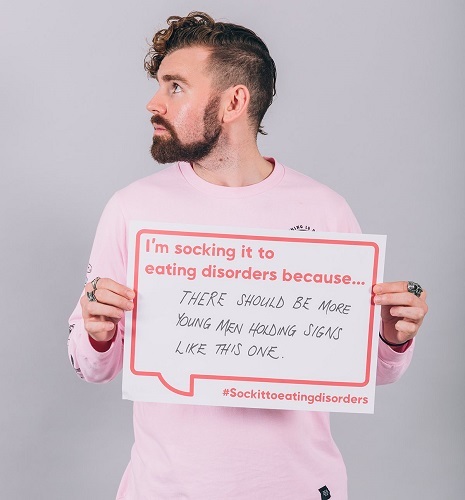 Eating Disorders Awareness Week from 25 February to 3 March is when all eating disorders treatment providers, charities and people affected by the condition, especially families, can put this topic right at the top of the agenda for GPs, NHS policy makers, the Media and society. “I will never forget what I went through but I know have this passion inside to help others because of it.” Ellern Mede has the permission from the author to post her full letter to mark the week, so look out for that. What better way to address this international awareness event about anorexia, bulimia, binge eating disorder, avoidant restrictive food disorders and related conditions that are so individual, that even now they defy categorisation. Early intervention – why wait? A key theme of this week from its organisers is to ask the question: “Why Wait”? BEAT research has shown that on average, 149 weeks pass before people seek help. YouGov did a survey conducted for this Eating Disorders Awareness Week and found that although this condition is written about a great deal, 34% UK adults in the poll, had difficulty actually naming any signs or symptoms of the condition and we realise this is a key challenge if we are to encourage people to go to their GP at the earliest stage to get treatment. We need to raise awareness of the signs and make it a conversation that is easier to have, regardless of the length or severity of symptomology.